I love spoiling people with gifts, especially my boyfriend, but I do know how they are hard to buy for! 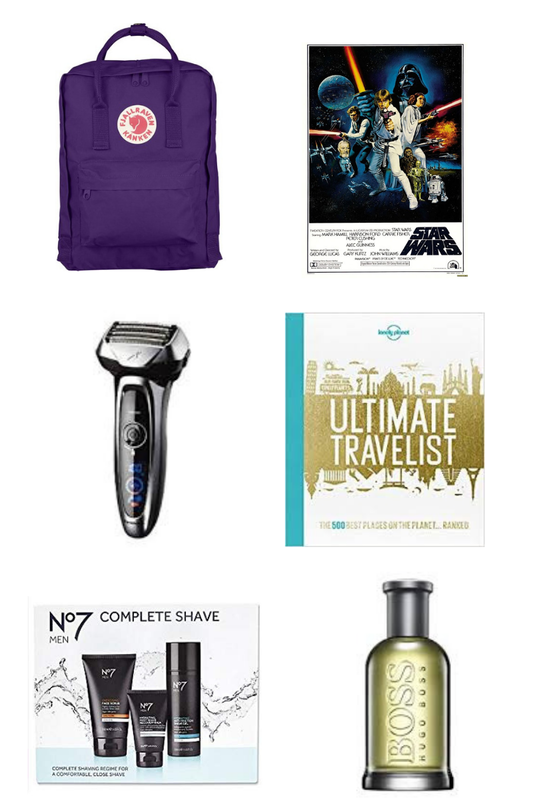 I've gathered some of my favourite gifts for him which you can bookmark for birthdays, Father's Day, anniversaries and Christmas. These options range from the more affordable ..... to the luxurious shavers from Panasonic UK. I've seen these backpacks everywhere! They are both on-trend and practical with a rainbow of colours available. They are perfect for someone who loves to go on trips or walks. Gadgets are a sure winner as a gift for men. Panasonic has a number of shavers available, he'd be over the moon if he was gifted one, plus they last for years! For any movie nerd, I recommend hunting on eBay for a cheap poster or print. I've seen some great ones for Star Wars, Harry Potter, Lord of the Rings, Pulp Fiction and Top Gun, so simply select a design of his favourite film. Alternatively, if he's more into travel, why not get him a print of his favourite city. If he's got a travel bucket list as long as his arm, gift him this beautiful book by Lonely Planet. He'll have plenty of inspiration and will want to book his next trip ASAP! Aftershave is a great option if you are stuck on what to buy him. I picked out the Boss Bottled fragrance but I also love Diesel Only For The Brave and Paco Rabanne. Boots No7 have an amazing skincare line for men. This one is a shave set but they also have daily facial moisturisers and cleansers for him so these would come in handy, especially if he keeps stealing yours! What will you buy him? My boyfriend and I had a belated Valentine's celebration last weekend in Liverpool. 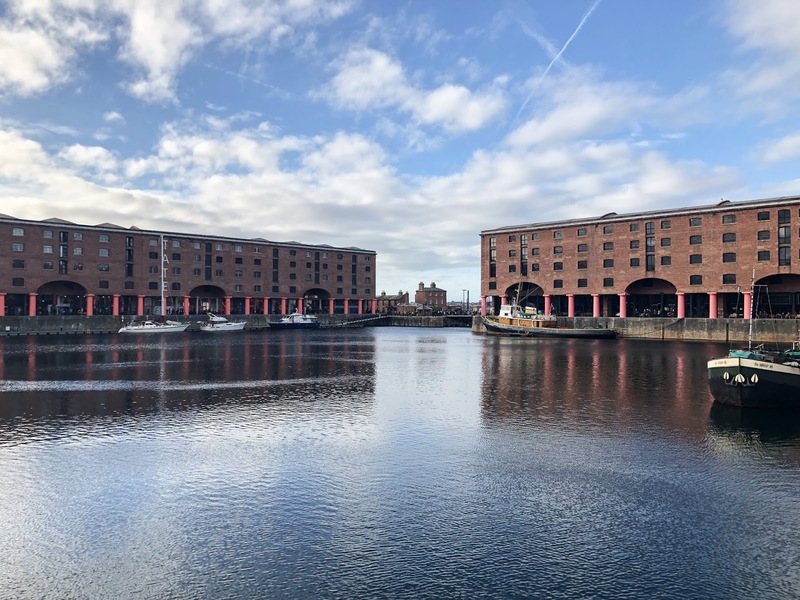 Living near Chester, Liverpool is so easy for us to get to, but if you are from outside the North West area, I highly recommend booking one of the many gorgeous hotels in Liverpool. We both love fine food, so we booked a table for lunch at the infamous Wreckfish. They offer high quality food in their stylish city centre location. 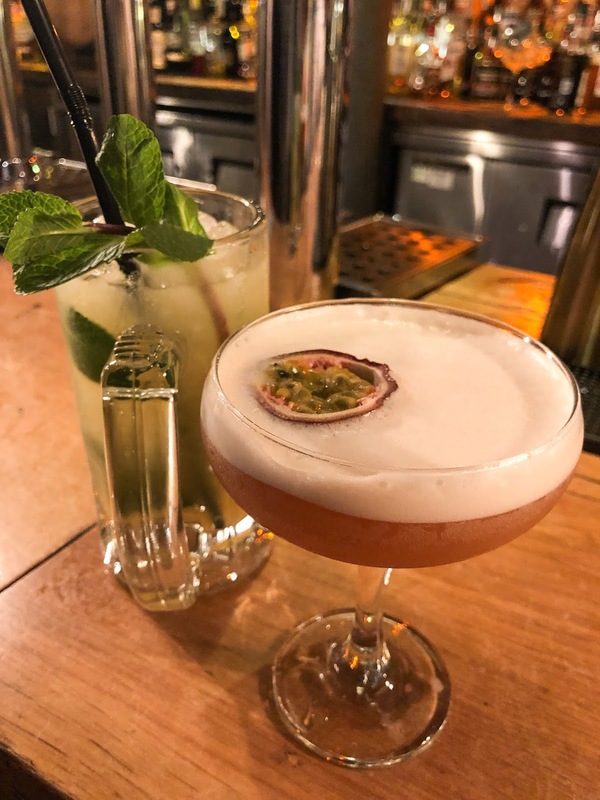 I recommend visiting at lunchtime as they have two offers available, 2 courses for £19 or 3 courses for £22, and they feature some of the same dishes on their evening menu, so the lunchtime offering is a more affordable way to try the dishes. To start, I had the confit crapaudine beetroot, candy beetroot, smoked beetroot purée and sticky walnuts. 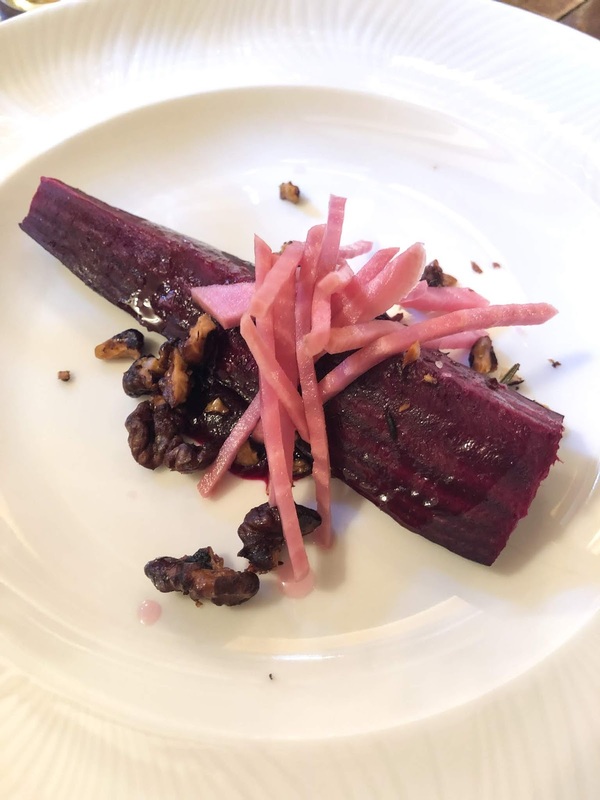 In layman's terms, it was beetroot three ways with candied walnuts. The dish had a great balance of textures and tastes. My boyfriend had the charred mackerel, nut ragù, roast cauliflower and confit turnip, which he enjoyed. Our main dishes arrived shortly after and they looked amazing! 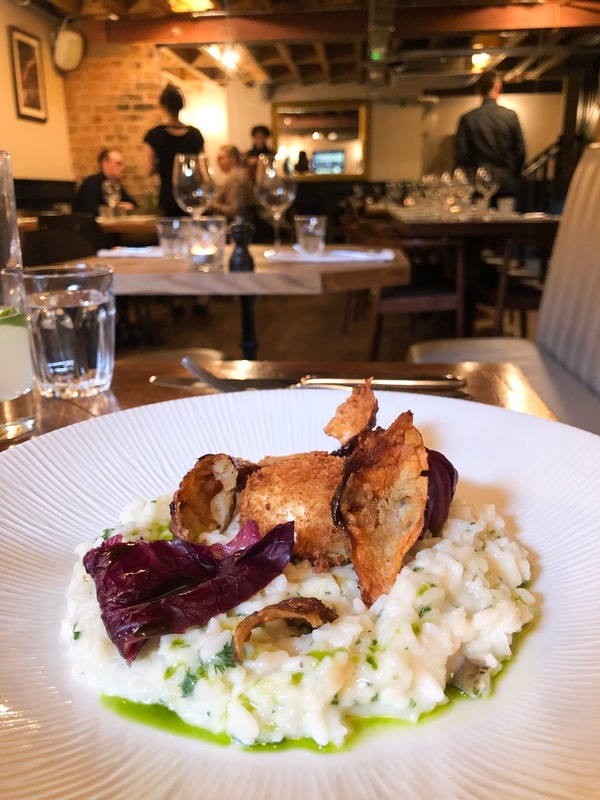 I opted for the Jerusalem artichoke risotto, poached hen’s egg and artichoke crisps. I'd never tried artichoke before but I adore risotto, I wasn't disappointed! Some risottos can be bland, but Wreckfish's offering was very flavourful and wholesome. My boyfriend had the braised feather blade of beef, cauliflower purée, parmesan and truffle chips (£3 supplement on lunch offer). I have eaten this at Wreckfish before and confirm that the dish is delicious. Although we were both full, we couldn't resist a dessert! 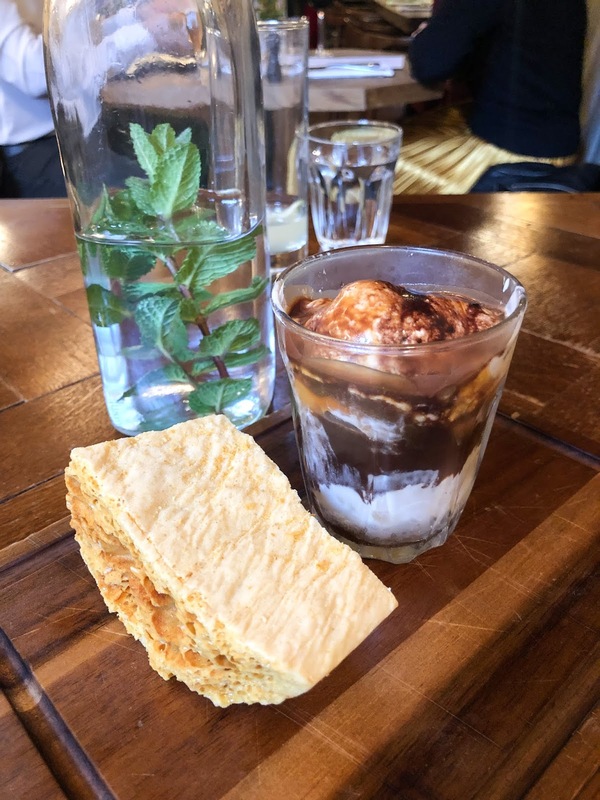 We choose the honeycomb semifreddo, dark chocolate sauce and fresh honeycomb, it was the perfect ending to our lunch. We continued to explore Liverpool to work off some of our lunch, we wandered around the shops and then headed to Albert Dock and visited the Tate art museum. It has free exhibitions, so well worth a look if you are in the area. We also stopped at the Smugglers Cove bar on the dock to rest our tired legs. It offered a vast range of ales and spirits and an exciting cocktail menu. I opted for a Smugglers Martini, which was their version of the classic Pornstar Martini. We had a great day out in Liverpool! What's your favourite thing to do in Liverpool? *The spending money was gifted by Hotels.com, but all views are my own. 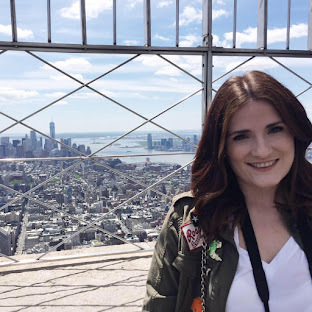 Labels: food, food review, lifestyle, liverpool, travel. 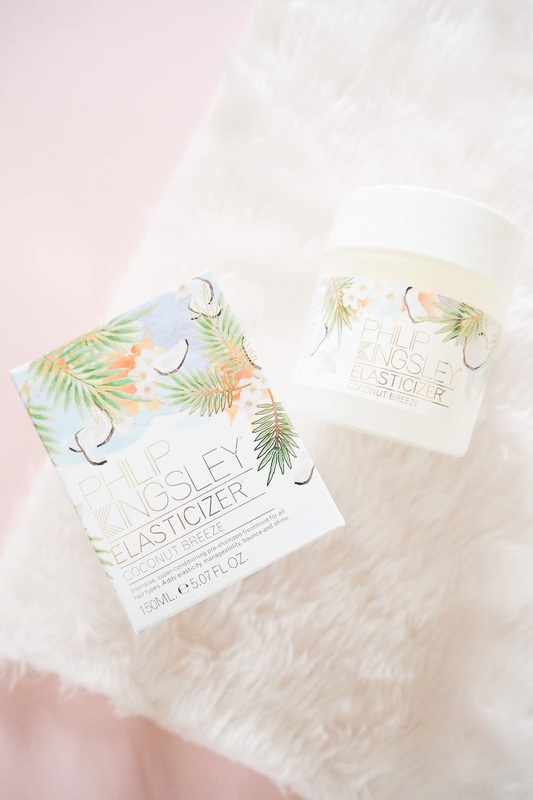 When I think of Philip Kingsley hair care, I think of the Elasticizer and I'm sure some of you do too! Brand Alley kindly sent me the Coconut Breeze version of this infamous product to trial and review. What's different about this hair treatment is that it needs to be applied before you shampoo and condition! It promises to be a 'super conditioning pre-shampoo treatment, which adds elasticity. bounce and shine to all hair types'. I find the best way to apply this is to wet your hair in the sink, bath or shower, then add the product to your hair and make sure it's covered from root to tip. I then use a shower cap as you need to leave it on for 10-20 minutes, I'll usually exfoliate and shave my legs in this time. Once done you can wash the treatment off and carry on with your normal shampooing and conditioning routine. If you don't mind sleeping in a shower cap or on a towel, you can also leave this treatment on overnight and wash off in the morning. When I came to blowdry my hair after the treatment, I noticed it was more manageable and had fewer tangles. The Coconut Breeze scent is incredible and a few people complimented me on it! This treatment is best for those who don't mind patiently waiting in the shower or bath. If that's you, it's sure to make your hair feel softer and smells amazing! Labels: beauty, hair, haircare, product review, review. Cult Beauty know exactly how to get the beauty community excited about new makeup launches, everyone has been hyped up over Milk Makeup coming over from the US to the UK. I myself have been caught up in this whirlwind and I'm currently lusting after the Matte Bronzer. I love stick bronzers and contours because their formulas tend to blend seamlessly with foundation. I've also heard great things about their Kush High Volume Mascara and Blur Liquid Matte Foundation. I'm already a huge fan of the Soap and Glory body care, their range is affordable and smells incredible. I wouldn't expect anything else for their new haircare range. They have shampoos, conditioners, serums, dry shampoos, and oils, but it was the hair mask that has grabbed my attention. I wanted to purchase the original stick formula of the Hourglass Vanish foundation but had read reviews that said it didn't last long, so it didn't seem good value for money. However, I think this liquid formula would be easier to use more sparingly than a stick. I'm not going to lie, the name of this piqued my interest. It sounds like it would pack more punch than your usual at home skincare. It contains Alpha Beta Extra Strength Peels (30 pads), Alpha Beta Pore Perfecting Cleansing Gel (60ml) and the Alpha Beta Exfoliating Moisturiser (15ml). Keeping Up with the Kardashian's is my guilty pleasure, I think Khloe might actually be my favourite sister. Her collaboration with Becca looks dreamy, this powder palette would be ideal for travel. I imagine the texture and finish to be the same as the Hourglass Ambient Lighting Powders. I watched a few interviews with Drew Barrymore on YouTube for the launch of Flower Beauty into the UK market and her charisma is so inspiring! The Supernova Skin Elixir seems to be one of the hero products of the line. It promises a glowy base to apply your makeup to. It would be interesting to see how the purple tone comes through on the skin! 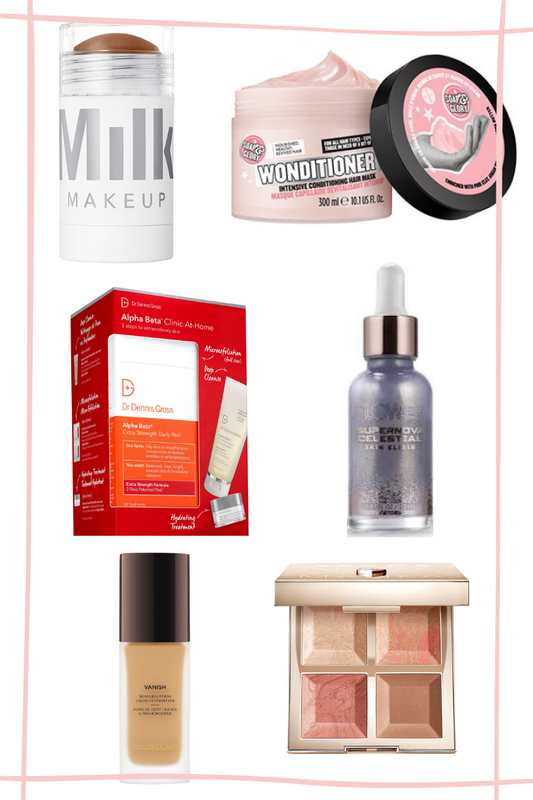 What's on your payday, new in beauty wishlist? Yes, I know wearing makeup in the gym is bad for you! However, as I have quite a bit of acne scarring, I need a little coverage even when going to the gym. Having a more even complexion gives me the confidence I need while working out. 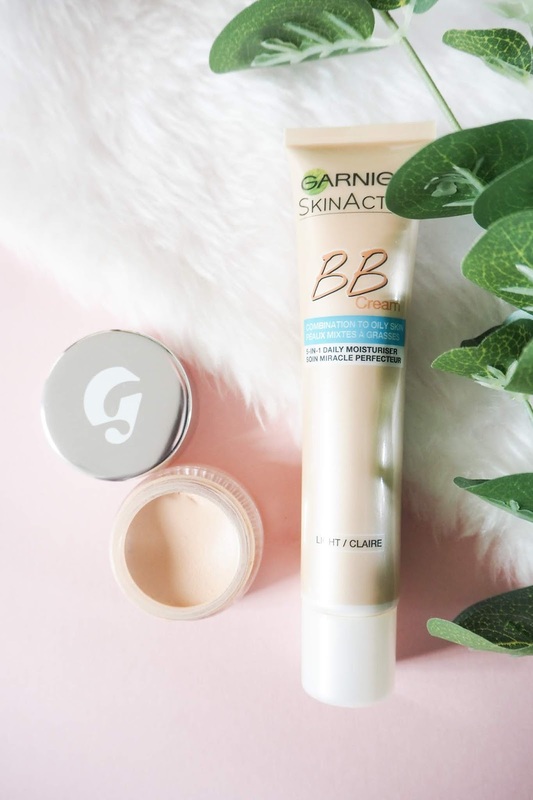 The Garnier BB Cream has been around for years, it was probably one of the first BB creams to become widely available to the Western market. I purchased the Oily to Combination Skin formula in the shade Light. Unfortunately, this product has a poor colour selection, I believe it only comes in Light and Medium. I'm a MAC NC15 for reference and the Light shade is slightly too dark for me. I use my fingers to work the BB Cream into the skin, I find a brush tends to create streaks as you apply. Using your fingers really helps you to work the product into the skin. The consistency is light and moisturising, it doesn't feel too heavy and has a nice subtle glow on the skin. The one thing that the Garnier BB Cream does not cover is my under eye circles, so I do need a touch of concealer to cancel out the purple tones. I use the Glossier Stretch Concealer in the shade Light, which is a better colour match for me compared to the BB Cream. I lightly pat this under my eyes, it's a moisturising formula, which again works best when applied with your fingers. It creates a brightening effect, which is ideal for a minimal makeup look. Both products combined give me the confidence to go to the gym, they are sweat proof and can be easily be removed after your workout. I don't think that either product would stay on all day due to their moisturising formulas but they are both quick and easy products to wear in the gym. Do you wear makeup to the gym?